My first challenge card for a long, long time. I have missed entering all the challenges. I used Dandelion Girl from Wee stamps, she is coloured with Copic pens and Spectrum Noir pencils. The Butterfly and stamens of the flowers were also coloured with the Copic pens to match the girls dress. The sentiment stamp is from Lili of the Valley. 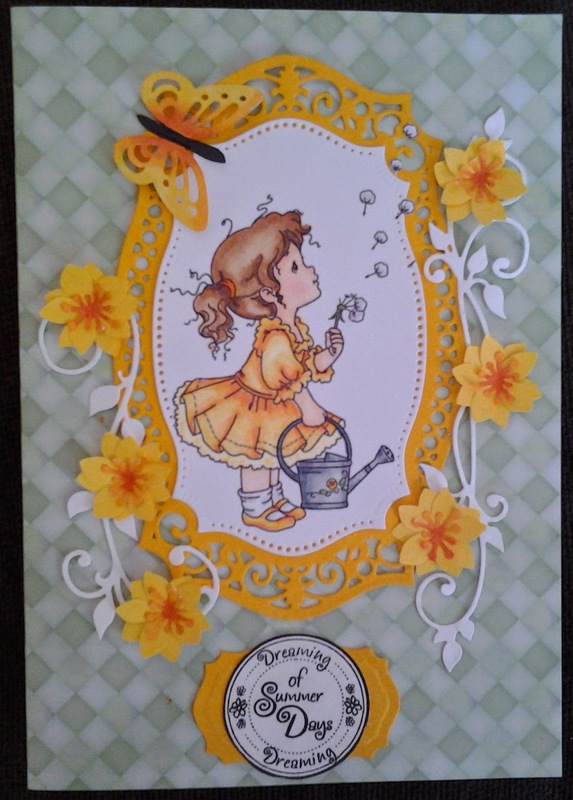 I know the flowers I have added are not dandelions but I like them and she is a cute stamp. Circle sentiment stamp from Lili of the Valley. Spellbinders Labels 25 and Majestic Labels 25. I am going to enter them in the following challenges. This is such an adorable card. Love that sweet image that you have colored so beautifully! thanks for playing along with us at DRS Designs! Lovely color scheme and such a fabulous design. Cute image. Thanks for joining our "May Flowers" -challenge at Charisma Cardz.